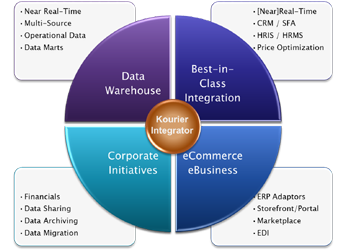 Kourier Integrator is Kore's flagship Enterprise Integration and Data Management Suite, providing Extract, Transform and Load (ETL) and Enterprise Application Integration (EAI) capabilities. 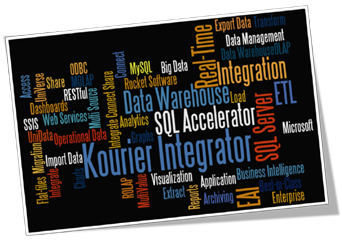 Kourier Integrator can help you extend the value and functionality of your enterprise application by enabling you to integrate and connect with disparate databases and best-in-class applications. 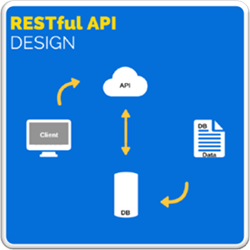 Integrate with best-in-class applications in real-time using RESTful Web Services or using message-based data imports and exports. Before you spend a fortune implementing a new enterprise application with the latest and greatest technology, let us show you how you can breathe new life into your current enterprise application for a fraction of the cost. Contact us to discuss cost-effective options that best-fit your budget and business needs. Many companies today are implementing or using best-in-class software applications and data warehouses to supplement their MultiValue application to improve specific areas of the business. Popular examples include: web-based eCommerce Storefronts and Customer Portals, Enterprise Business Intelligence (BI) and Dashboards, Customer Relationship Management (CRM), Sales Force Automation (SFA), and Accounting systems. With Kourier Integrator these applications can be seamlessly integrated and operate as though they were an integral part of your MultiValue application. This will ensure data consistency while eliminating costly and redundant data entry. Your enterprise will become more efficient and productive, saving you time and money. Kouier Integrator provides out-of-the-box Enterprise Application Integration (EAI) functionality for integrating MultiValue systems in real-time with external applications via REST-based application programming interfaces (APIs). Kourier's REST framework and the Kourier REST Gateway are Kore’s easy-to-use and versatile real-time integration solutions for MultiValue. Kourier REST streamlines and simplifies the process of building and testing bi-directional integrations using RESTful Web Services. The REST Gateway provides secure, scalable real-time access to MV applications via REST APIs from inside or outside the corporate firewall. Kourier REST also supports API Subscriptions (Webhooks) enabling real-time notification of changes to data in the source application. Of course you need good documentation and Kourier REST automatically generates interactive API documentation in Swagger format. Add SQL Accelerator (optional) to Kourier for seamless integration between UniData/UniVerse (U2), other external data sources and Microsoft's SQL Server database. Currently supported non-U2 data sources include: Oracle, MySQL, Microsoft Access, Microsoft SQL Server, Apache Derby, PostgreSQL, Microsoft Excel and text files. 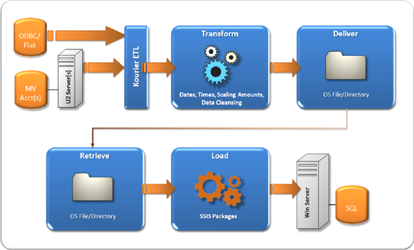 Ideal for application integration or building a full-blown data warehouse, SQL Accelerator is the key component for connecting multiple data sources with Microsoft SQL Server databases because it automatically generates the SQL Server Integration Services (SSIS) packages that enable the near real-time integration between disparate databases and Microsoft SQL Server databases. Kourier Integrator was written specifically for the UniData/UniVerse (U2) extended relational databases (Rocket Software), and is designed to simplify MultiValue integration to SQL Server databases. Kourier is designed for compatibility with any U2 application (homegrown, bespoke and commercial) and it has been implemented with many of the leading commercial U2 applications. Several pre-defined Operational Data Stores (ODS) are available for popular U2 applications such as: Ellucian Colleague, Epicor DataFlo, Epicor Eclipse and Epicor Prelude. Each ODS is fully customizable to meet your unique needs and provides a quick start implementation using key data files from the application. 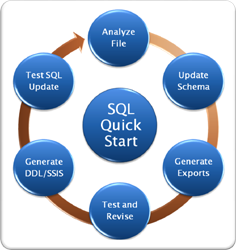 The result is a normalized SQL Server database that you can use as the basis for developing custom reports or as the foundation for a more complete business intelligence and executive dashboard solution. The solution pricing includes all the software and services needed for a complete solution, and we'll even help you with your first project. Note that Kourier Integrator solutions are typically installed on your servers (application, web and database) and must meet certain minimum requirements, call Kore for details.